The following links list parts specific to the aircraft type listed. Many parts on WWII Aircraft were generic i.e. used in other aircraft types and these will be found in the pages listed above. 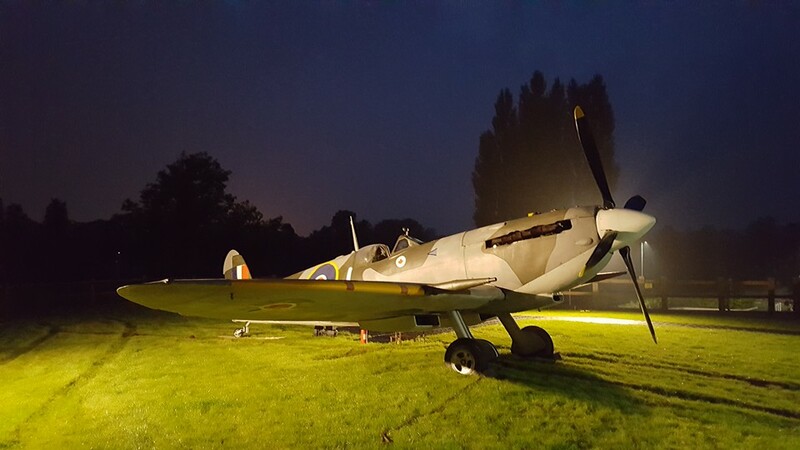 The Spitfire experience offers you the opportunity to experience the site smell and sound of the iconic RAF Spitfire. The Spitfire experience means you will sit in the cockpit and start the Rolls Royce 27 Litre engine which will run for approximately one minute and be taken up to full power. One of our experienced and knowledgeable crew will give you a briefing and you will be able to take pictures or video of your experience. 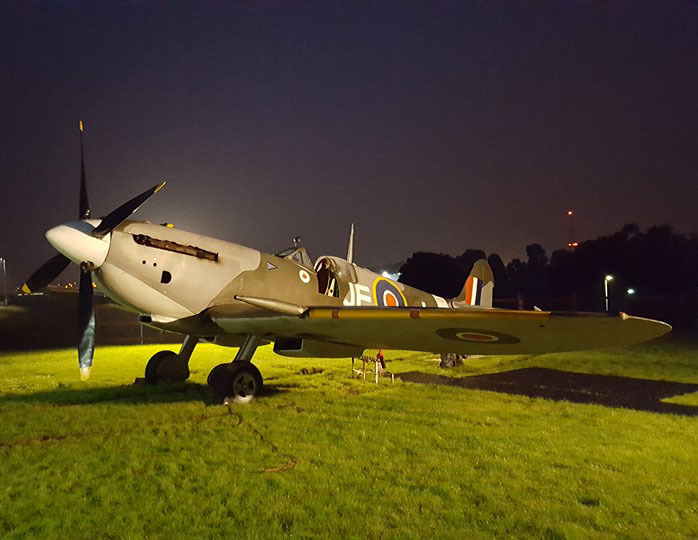 This is a unique experience our Spitfire EN 398 is the only full scale replica Spitfire in the world, which can be transported by road to events that has a full original cockpit and working engine. Spitfire Mk IX EN398 took its maiden flight without problems on 13th February, 1943. On 18th February the aircraft was delivered to No 402 (Canadian) Squadron at RAF Kenley. There Ian Keltie took possession of it and used EN398 (then coded AE*I) exclusively until mid March (by now coded AE*B), when 402 moved. Keltie's last mission in EN398 occurred on March 13. When 402 moved however, EN398 was left for their replacement squadron, also Canadian, No 416 Squadron. It is interesting to note that Johnson remained convinced, almost until his death, that EN398 was unused at this time, and the clean fresh paint was factory applied. However, the reason the paint was fresh had more to do with the removal of the "Popeye" nose art and other maintenance. Johnson was also convinced that the Maple Leaf painted on the side just below the windshield was green rather than red. Johnson's next step was to have his initials painted on the fuselage to establish the aircraft as his own. Before he took the Spitfire into action Johnson demanded two more changes. EN398's guns were set to a standard harmonization pattern designed to spread the rounds evenly over a circle a few feet across so as to give the average pilot a better chance of scoring hits. However, Johnson's shooting skills were far above the average. To concentrate all the destructive power at his command he had his aircraft's weapons harmonized to a single point. In addition, Johnson had the Gyroscopic gun site removed and his older style one from his Mk V installed in it's place as he preferred it. By the end of May, 1943, Johnson had added six victories and one shared victory to his score, whilst flying EN398. On 1 June he shared in the destruction of a Me 109, on the 15 June he destroyed two FW 190s, with one more on 17 June. Although EN398 was the Wing Leader's personal aircraft, and he was normally the only pilot to fly it, there was occasionally a need for the aircraft to make up the numbers during his absence. On 20 June Sqn Ldr Robert McNair (OC 421 Sqn.) flew EN398 in action and was credited with the destruction of one FW 190. On 24 June, Johnson destroyed a FW 190 and damaged a Me 109. Another FW 190 fell to his guns three days later. On 15 July to he led the Wing on a fighter sweep which added a Me 109 to his score. Another one was added on 25 July, one damaged on 29 July, and a share in the destruction of one more on 30 July. Success continued throughout August. He shared in the destruction of a Me 109 plus another one damaged on 12 August. On 17 August the Wing escorted B-17s on their way, and return from, the ball-bearing factory at Schweinfurt. During the action Johnson shared in the destruction of a Me 110. A further Me 109 was destroyed on 23 August. While EN398 went off to Air Service Training at Hamble for an engine change, Johnson, in a borrowed aircraft, shot down another FW 190 on 4 September. Back with EN398 he damaged a Me 109. That was to be his last claim before relinquishing his command of the Wing a few days later. During his six months flying EN398, Johnson had shot down 12 enemy aircraft and shared in the destruction of five more. Also, he had inflicted damage on a further six enemy aircraft, plus a share in one more. During that time EN398 had also destroyed a FW 190 whilst being flown by Robert McNair. Remarkably, EN398 never broke off a mission early through technical failure. After Johnson moved on to No 11 Group Headquarters, EN398 went to No. 421 Squadron for a couple of weeks before sustaining damage necessitating its return to Hamble for repairs. The aircraft never returned to operations (new aircraft were being delivered to units faster than they could be repaired by that time). EN398 remained in store for the remainder of the war in Europe. EN398 was retrieved in May 1946 to go to No. 80 Operational Training Unit, RAF Morpeth and Ouston, in Northumberland. There, it was used in the training of young French pilots. That unit was disbanded in March 1949, and EN398 took off for the final time to go to No. 29 Maintenance Unit, High Ercal, in Shropshire. There she remained in long-term storage for three-and-a-half years. In October, 1952 Spitfire Mk IXc, serial number EN398, was sold to H. Bath & Son Ltd for scrap and was cut up soon thereafter.